Great stuff here and very informative. 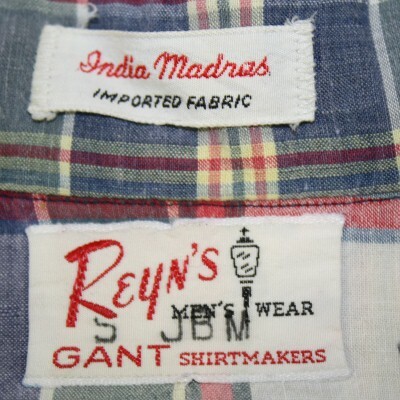 There’s a lot of focus on Brooks and J Press amongst ivy fans, often forgetting that those companies were just the tip of an iceberg of style. Thanks Woof, it has been a question that has been bugging me for ages. That funny BD looks like a genuine justification for a button to hold it down. But. 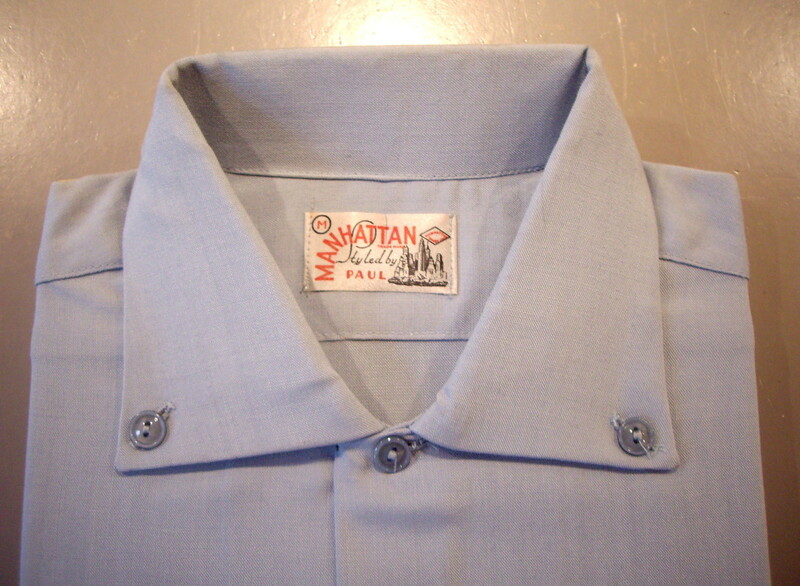 I’ve often wondered about the story/myth/marketing blurb about the button down being copied from English polo shirts. I think it is pretty accepted, pins, buttons, and other methods were used to hold the collars down on polo shirts, which were of course pull-overs to start, and they held that kind of upper-class connotation all the way through, I have a good bit of POS blurb at work from La Martina an Argentinian polo brand who started in 1939, who did a little book on the history of the button-down with photos from the early part of the 20th century. I’ll try get some photos. Great stuff, the chronology of the look throws in some very interesting stuff. The ‘sport’ and ‘leisure’ manufacturers all seemed to run towards a more youthful look in post WWII America. ‘Ivy’ must have been a marketing dream for them having both youth and traditional connotations. Aye, finding that McGregor advert for 1947 sure threw a spanner in the works with my theory it was a 50’s thing, maybe you’re right it is a post war thing. The story of Ivy marketing to the mainstream starts earlier than I thought. a wider age range going to college because of the GI Bill, means a larger demographic to aim ‘college wear’ at. 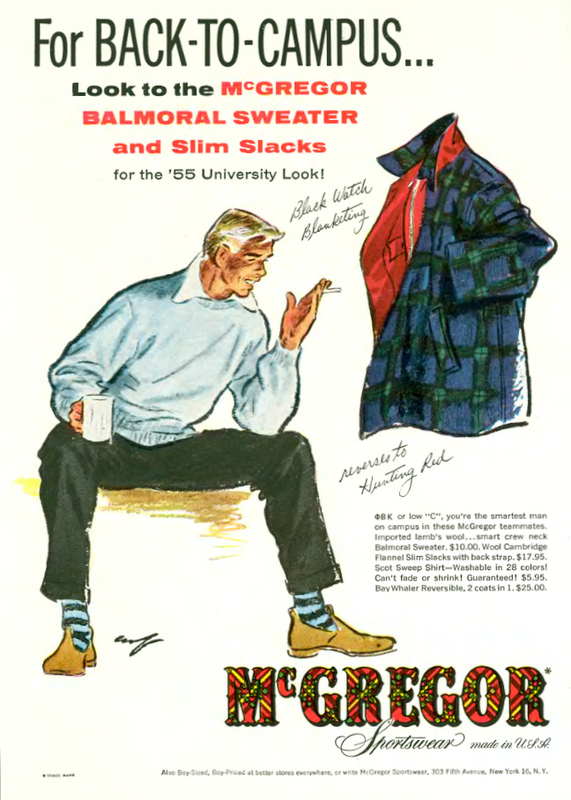 Clothes marketed as ‘campus wear’ in the 50s being remarketed as ‘Ivy League’ a few years later with little or no stylistic changes. It all seems to lead into the ‘Ivy’ look becoming the clothes of mainstream America. Well I know the American top brass were scared of anything happening like it had in Germany in the U.S. So they obviously developed their economy around aspirational products in order to keep people feeling gratified, and to avoid civil unrest. That is pretty well documented. Maybe (at a long shot) the aspiration of an Ivy League education became an affirmation of this pre-meditated marketing and advertising? This sort of links in with the battle between the ideas of ‘negative’ and ‘positive’ liberty, it’s been an ongoing thread in US politics since that time. Positive meaning an aspirational ‘ push the edges of the barrier’ culture versus negative meaning a protectionist ‘build the barriers higher’ mind-set. Adam Curtis has some great documentaries around this subject of the post war period.